Professional Affordable Web Design Internet Marketing SEO Company. All-In-One Web Design, Development, SEO, Internet Marketing, Graphic / Logo Design, Ecommerce Stores, & Internet / IT Consulting Services in Lowell and Grand Rapids, Michigan. We work closely with you (our client), to create custom, professional websites that are findable, functional, and affordable. Our primary goal is to exceed all of your website, internet, and IT expectations to help your company grow. 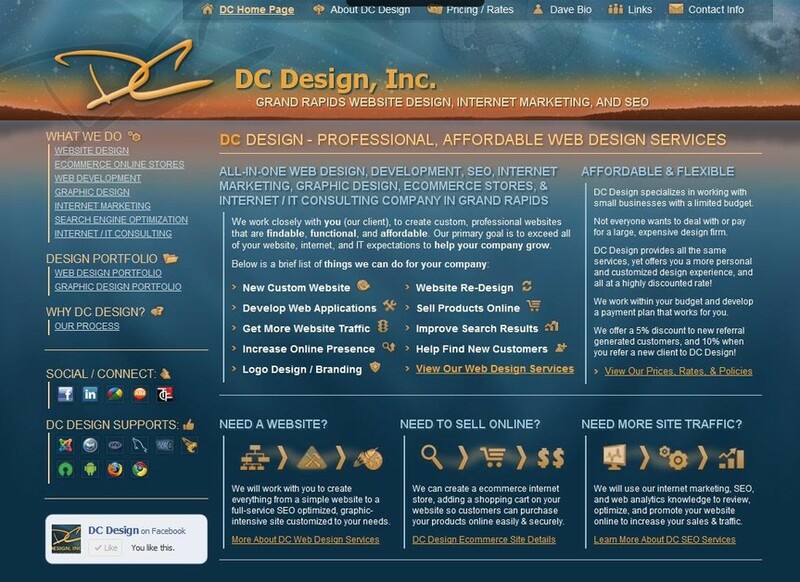 DC Design homepage, designed and developed to outline and showcase our web design, website development, ecommerce, search engine optimization, internet marketing, and graphic / logo design work.